One Dream World: Mr. C. Thomas - the forgotten soul..
Every life on earth takes on an inspiration during childhood from some or the other figure. I caught on with my dad. 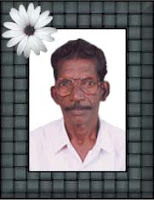 My dad Mr. C. Thomas was a very hard and rough person with a strong sense of discipline and values. He hardly passed 5th standard in Kerala and had a very rough childhood and teenage. He ran away from home due to lot of physical and emotional torture and came to Mysore and worked as a laborer. He worked up his way through many ups and down and finally got into M.E.S. (Military Engineering Service) as a labor person. He slogged his way up and he managed to reach the post of senior electrician during the time of his retirement. After retirement he couldnt really enjoy being relaxed back for all the continous number of years that he worked relentlessly and he passed away on October 4, 2004. That is him in a nutshell but my life around him stretched far beyond than the paragraph above. Today what I am is more than 60% due to him. He was known to a very hard and short-tempered person. He always reacted impulsively to situations and people. He was voilent at home verbally and physically. I have lost trace of the times that I have taken physical thrashings and verbal lashing at almost all occasions. We all were dead scared of him including my mom and two younger sisters. BUT BUT BUT, this is all that people have actually known about my father. Apart from these qualities he was a gem of a person. He understood people in depth, was always there for any kind of service at any given hour of the day or night, he worked relentlessly for the underpriviledged, he supported and defended the weak, he had a great great sense of humor and could laugh on himself anytime, he gave more than asked for, he was a very hard worker, an avid volleyball player, active in drama, gave his services in all religious festivals, regularly Ganesh festival and Ayyappa pooja activities, sorted out many problems of his co-workers, and the list could go on and on. He was much praised and known for all his activities. I am known here in Belgaum to many communities and families through him itself. People recognize me still as the son of Electrician Thomas. He was never shy of his position and whenever he would see his children being attracted to material things, he would always remind us that we are from a humble family. He taught us good values of paying respect to elders, behaving while we visited anybody's house, to eat in the right way, sit upright, sleep the right way, avoid gossip, respect other's privacy, not to own anyone else's belonging, be disciplined at work and follow timings, get up early and go to bed early, how to face problems in life, how to be sacrificing at times, how to live in difficult times, etc. I used to absorb all this practical teachings immediately. Though a God-fearing Christian he never went to church but prayed regularly at home and emphasized that God is within. He never celebrated his birthday and for years his birth date remained a secret to us all, not even my mother knew surely the date, but he used to never miss a single birthday of his children. He gifted us something or atleast cash during our birthdays. He used to stitch new clothes for us or buy new shoes for us during Christmas season and I know how he would take money from somewhere or the other to meet our needs. He saw to it that though in a simple manner he gave us what we asked for. He maintained a diary since 1971 and noted every single earning and expense of every month till the day he retired; we have this journal with me. I remember him sitting with cash on the day of his salary and distributing the notes of different currencies on the bed for different expenses. From that he would keep three Rs.50/- notes for depositing as saving for his his 3 children. Though my childhood went in poverty, we lived a happy life. Or at least I can say that my father ensured we lived comfortably. All his salary went into the monthly expenses, especially since we three we in Convent schools. He rotated money from here to there all his life. We lived in small military government quarters since he was serving the army in the civil department. The house had just 3 rooms including the kitchen and we all slept in one small room. He learnt English as far as he could read and write but couldn't speak and he used these skills and became the Union Secretary and successfully and popularly remained as someone whom any employees could turn to for professional or personal help. He was an enthusiast all his life who never bowed to any worries of life. He was of thin structure and used to always move around on his cycle. He awed me when he went ahead with a project of forming a Co-operative Society in the Govt office. He remained the Chairman of the same till he retired. I do not know how it faired because I never liked him being in these positions with high stress and consistent expectations from peers. He was also a target of criticism and created enemies in these positions. Though he was frail he was feared. He was very very bold with truth and never bowed to anything or anyone that opposed it. I followed almost all his ideals but at the same time I admit remained affected by his negativities too. But now when I look back I dont think it is anything to talk about because today I have the maturity and understanding to release what isn't good from within me, but I hold on dearly to all his values that he taught me either consciously or subconsciously. He loved me the most among all. His last days were not good and he turned very frustrated when he was bed-ridden. The negative aspects of him slowly took over him in his final days and he just point blank refused to co-operate. I hardly spoke to him in his bed-ridden days because I was highly stressed of the whole atmosphere and his reluctance to see things right. This was the time I had got my first glimpse into spirituality and began connecting with people who were healers. He passed away right in front of me as I assured him everything is okay and will be taken care of. He glued his eyes on me till the last as though acknowledging whatever I said and breathed his last. I was simply staring into death and I saw it very closely. After that day life has never been the same for me. I was highly dependent on him and found myself thrown into a world full of insecurities. It's been four years since he has gone but I remember him and hold him dearly to my heart. I shall never forget his sacrifices and the warmth of his love that radiated right through my heart. I do miss terribly his physical presence but never the glimpses of his love and care. Love you Dad!